This recipe has taken up space in my recipe binder for a good three years. To be honest, I was a little intimidated. I know that sounds lame but I truly I was! Then I knocked a little sense into myself by talking myself out of talking myself out of making such a dessert (did you get all that?!) Who is to say I couldn't do it despite my lack of pedigree? Anyone can do anything with a little motivation and effort, right? I decided with two family birthdays to celebrate it must be made. I made it in four stages the day before. Let it be known--I love make ahead desserts. Especially ones that taste divine, like this one. 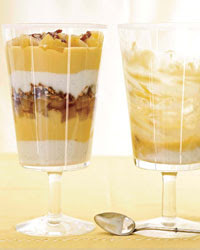 What a fantastic recipe to have on hand, if you love passion fruit and coconut like I do. Click here for the recipe. It's sooooooo good. yummy! i might just try that one of these days! mmmmm...2 posts in a row that make me think of sunshine and spring. Great Rx for the winter blahs. That'd definitely a make-ahead treat...I'm thinking for Easter???. BTW: the cauliflower gratin turned out just lovely. Hubby doesn't like cauliflower at all but devoured the dish! Thanks for the tips! just a quick question about cords. do you have a plug in station at your house? How do you hide all the cords. Lets see: gps, cell phones, computer, 3 cameras, video camera, robbie's camera, palm pilots...and that is not to mention all the computer components. Please help me out..I need some organizational inspiration! Chelsea, email me and I'll give you a few ideas! Wow that was amazing, thanks for making it for us!